T.R.U.T.H. Project uses artistic expression to bring awareness about HIV/AIDS to African American GLBT Community and Allies. The T.R.U.T.H. Project also addresses factors directly related to the rise of HIV/AIDS such as stigma, bullying and discrimination, while promoting the importance of HIV and STD testing. 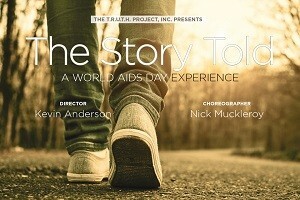 Directed by Kevin Anderson and choreographed by Nick Muckleroy, this multidisciplinary performance uses spoken word, movement, song and theater to explore issues of HIV stigma, prevention and education. The T.R.U.T.H. Project, a 501c3 organization, mobilizes LGBTQ communities of color and their allies through social arts that promote mental, emotional and sexual health. HIV remains a major issue in Houston and Harris County: In 2014, there were an estimated 23,304 diagnosed people with HIV, with 75 percent of those cases men and 25 percent women. Half of the people with diagnosed HIV in 2014 were black, 27 percent were Hispanic/Latino and 19 percent were white.